In 2011, then-21 year old Tyson Gersh met Darin Mcleskey at the University of Michigan. According to Gersh, who grew up in nearby college-town Ann Arbor, McLeskey was the first person who ever used the words “Detroit” and “cool” in the same sentence. People had always told him that Detroit was a scary place. After Mcleskey talked Gersh into taking a first road trip 50 miles down I-94, past the airport, Gersh was amazed to see skyscrapers. Mcleskey, who grew up around farms in Pinckney, Michigan, and Gersh, who had worked as a landscaper and had grown his own food for several years, began to talk about the possibilities of building an urban farm in the city. In late 2011, the pair purchased a vacant six-unit, three story apartment building on Brush Street in Detroit’s North End neighborhood in a tax auction, including nearly two city blocks of vacant land. The pair also purchased nearly three additional acres nearby. They incorporated the Michigan Urban Farming Initiative as a 501(c)3 nonprofit in May of 2012 and began developing plans that, according to Gersh, have evolved into a “crazy comprehensive approach” for implementing urban agriculture as a tool for addressing structural food inequality through education and community building. MUFI’s ongoing projects, all in various stages of implementation, include a demonstration urban farm, a nursery aquaponic system in a nearby warehouse, a children’s sensory garden, a memorial orchard and vineyard, a hostel, a community center, and a kitchen incubator space. The organization has over 5000 “highly engaged, obsessive” Facebook fans, according to Gersh, and has logged over 15,000 volunteer hours since May, mostly a mix of Detroiters and metro Detroiters who hooked into the project via social media. The project began as an entirely self-funded venture, supplemented with winnings from various online contests geared at social entrepreneurs. According to Gersh, the organization has won over $20,000 in funds through contests via the optiMize Social Innovation Challenge, Do it for Detroit micro-grant fund, Ford, a local hair salon, and Detroit Soup. Whole Foods Detroit has also become a big supporter, according to Gersh. “We were both working students with no wealthy parents,” says Gersh about himself and Mcleskey. Mcleskey, who has a degree in civil engineering, also works in private consulting, and Gersh has worked as a server and research assistant. Gersh plans to pursue doctorate studies in social psychology. As newcomers to the community, the pair has been proactive in reaching out to established community groups and churches. “The area has only one or two inhabited homes within 4 blocks,” says Gersh. But he says the community is involved, helping with equipment storage and organization. The farm sells produce at the Oakland Avenue Farmer’s Market, and gives produce away for free to neighborhood residents. Long-term plans for fiscal sustainability are not yet fully formed, but ideas for generating revenue include forming a for-profit subsidiary to sell farm products at the aquaponics warehouse, the hostel, tenant farming, and soil testing and analysis services. “We’re looking to have diverse sources of revenue,” says Gersh. Gersh notes the needs are diverse, including poor mothers with little education who are “victims of the food system” to resident kids with few community resources, to unemployed people who can benefit from tenant farming opportunities, to suburbanites looking for a way to connect with and serve the inner city. Challenges, according to Gersh, are those “universal to startups” including developing an organizational culture, funding the politics of urban agriculture, which in Detroit, can be especially treacherous and tied with racial politics. MUFI is addressing these challenges by asking members of the community to serve on a community advisory council for MUFI composed of long-time residents and business owners who will vet decisions. In the future Gersh hopes to expand the organization across Michigan, with local chapters implementing urban farms in other distressed communities across the state. But for now, he is focused on Detroit. “We need to focus on getting our site up and running and perfect, and start what we finish before moving on,” he says. 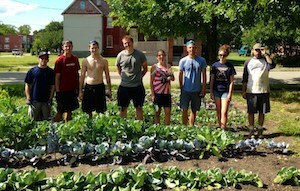 Launch Michigan Urban Farming Initiative to Educate and Build Community <Liked it!